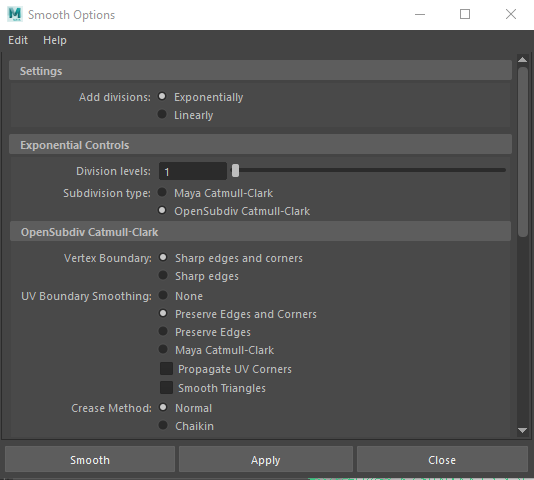 Can an expert give a final word on Catmark Subdiv and How To in Maya? I've spent a couple weeks now getting my FBX exports perfect out of Daz and setting up my Genesis 8 figure in Maya. I'm at the final stage, which has me totally stumped: subdivision. For the sake of clarity, I want to say at the outset that I am exporting only the hi-res mesh and of course WITHOUT any subdivision in Daz as that, as we all know, is impossible. What has me baffled is that all Maya's subdivision algorithms (namely Opensubdiv and Maya Catmull-Clark) do not subdivide the way Daz's "Catmark" does. Instead Maya subdivides exactly like Daz's "Catmull-Clark Legacy" does. You can notice that "Catmull-Clark Legacy" is a bad option for the G8 figure by looking at the teeth. "Catmull-Clark Legacy" overly smooths the teeth and shrinks them, whereas "Catmark" actually makes the teeth bigger than the actual "cage" or original hi-res mesh at sub-division 0. 1) What is "catmark" subdivision? There is very little information, except one forum post that mentions it is a newer Pixar refinement of Opensubdiv. I also see a couple development docs relating "catmark" to an option in Opensubdiv called Sub_tri_Catmark, but no idea what this is or where to set it in Maya when using Opensubdiv. 2) How can I get Maya to subdivide the hi-res mesh the way that Daz does? To do this I would need to know what "catmark" is doing and recreate that in Maya or find a Maya addon or find the right settings in Maya (I have tried a lot with both smooth mesh preview, subdivision proxies, and renderer specific subdivision algorithms. In the attached screenshot you can see what Maya's subdivision does to the teeth. it shrinks and smooths them in a way that doesn't look right at all. This seems to be exactly what Daz's "Catmull-Clark Legacy" does also. You may want to look into the settings for the sub-divisions. It determines how hard/soft certain aspects of the "deformations" will be calculated. In Daz3D, the settings are for "Sharp edges", and "Normals smoothed", by default, for Gen8. Nothing except "Catmark", with those settings, will look exactly like Daz3D subdivisions. If you do not have settings for those options, then you may be out of luck. Though, they may be worded another way, in another program. I believe the legacy Catmull-Clark stuff was what DazStudio used before OpenSubDiv was supported. Which probably means they wrote it themselves, so how can you expect it to work exactly the same somewhere else? DS didn't use Pixar's OSD until version 4.5.2.40. I can't say i'm expecting anything in particular, but i can say i'm trying to get as close as I can in Maya. Unfortunately no matter what I try I'm losing a lot of detail on the ears and inside mouth/teeth in particular. I can't even figure out if I should be exporting the hi resolution mesh or the base mesh from Daz to Maya via fbx?? You can see subtle difference in the waterline/lash placement between the two. So all in all I'm pretty confused. Export the base mesh, then apply SubD in Maya. HD moprhs will not trasnfer via FBX - you will need tore create them in Maya (I believe it can do that) via an OBJ files exported with the high resolution shape. I had hoped something like that would work, but with all my attempts to create a blendshape between the base mesh subdivided in maya and the HD obj, it never works. I'm guessing this is because the subdivision algorithms are different and even though the poly/vertex count is the exact same between both, the vertex ids are different. I'm just speculating. I heard you can use the seuvblendshape plugin, but don't know how reliable that is. DS is using OpenSubDiv so I'm not sure why the results would be inconsistent. Indeed, as far as I am aware HD moprhs are built on the OpenSubDiv version of multi-resolution morphs, though treat that with a cinsiderable degree of wariness. >I'm at the final stage, which has me totally stumped: subdivision. Place two Genesis 8 Females in your scene. "Subdivide" only one of them. Color one white and one red. Subdivision isn't in the habit of swelling your character, yet your "subdivided" character is bigger than its base resolution counterpart (like the teeth you noticed). No software package will mimic that high res daz character. Houdini and Maya both give identical results across the board for subdivision methods, I'll bet most packages will. Daz is the odd one out, because it's not just subdiving. Subdivision is EXTREMELY predictable. You don't have a subdivision problem. You have a daz problem. 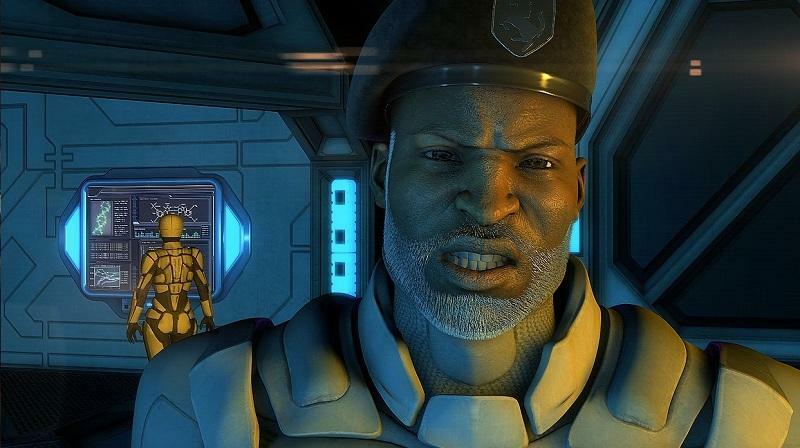 If you just wanted a static character, you would have converted to prop and transfered that, so I'm assuming you want to move the character, in which case you are so, so far from the final stage. If you're intending to use a rigged character in Maya, take my advice: Abandon ship. It's not going to happen, and whatever does happen is going to look completely atrocious. Don't believe people who claim to have managed. They have not. Unless they completely redid the rig and weights, in which case they've essentially rebuilt the character, not transfered it. I don't call applying a normal map and making a close-up of a characters default, un-changed face "managing to transfer a character", and if you're trying to solve the problem you are, neither do you. If you're intending to use a rigged character in Maya, take my advice: Abandon ship. It's not going to happen, and whatever does happen is going to look completely atrocious. Don't believe people who claim to have managed. They have not. Unless they completely redid the rig and weights, in which case they've essentially rebuilt the character, not transfered it. I don't call applying a normal map and making a close-up of a characters default, un-changed face "managing to transfer a character"
I Must agree with your general sentiment although I would not call it a"problem"
When you leave Daz studio.. You...... leave...... Genesis. No teeth distortion or bloating. These are Empty C4D copies of Daz meshes driven by external MDD files ..NOT "Genesis in C4D"
In My Opinion The Genesis to Maya plugins are the big lie people keep fobbing off to themselves and each other. They use the Daz industry standard FBX exporter to bake out a rigged copy of the Genesis base mesh. and engage in all manner of scripted trickery and nerdy McNerd technobabble to distract people from realizing that they are simply using the native rigging and weighting tools of the importing app to try to emulate the general behavior of a Daz genesis model with regard to joint deformations. And in the end you still have to perform all manner of manual labor trying to recreate a fully functional genesis model outside of its native environment of Daz studio. A truly pointless endeavor IMHO. I appreciate all of your honesty though the conclusion is depressing. All and all i'm doing well with Genesis 8 in Maya, but yes i am exporting the base mesh to avoid this problem of my subdivided characters teeth getting smaller and losing detail in body parts like the ears especially. I prefer to export from Daz manually and avoid the Daz to Maya type plugins as they over-complicate things that aren't that complicated. * Facial Expression Morphs from the Daz store rarely tell you whether or not they used the base or hi-res mesh so some morphs will end up shrinking the teeth in Maya because they're using the hi-res daz mesh, which as we all know has the same poly count as the base mesh. Wow, there are certainly some strong opinions in this thread. I'm one of the people who "claim to have managed" to utilize HD characters in Maya, and hope I can clear up some misconceptions. I won't be providing a full step by step workflow in this comment but I can point you in the right direction. When it comes to plugins/scripts, in my opinion Genesis 8 for Maya (https://www.daz3d.com/genesis-8-for-maya) is more complete than Daz to Maya (https://www.daz3d.com/daz-to-maya). Daz to Maya does have an option to convert the shaders to other render engines, but considering all the textures aren't exported by Daz Studio as default I prefer to set them up from scratch anyway. You can always save it as a material in Maya to apply to any other import and simply swap the textures, or script it rather easily. The "all manner of scripted trickery and nerdy McNerd technobabble" the scripts perform IS using the native Maya tools to emulate the Daz Studio behaviour, but why is that a bad thing? It's simply setting up joints to control JCM's and facial morphs to work in tandem where needed, exactly what Daz Studio is doing internally. By the point that you're exporting a character to Maya for animation you are likely to have made final decisions on their appearance, so losing the ability to completely change the character isn't a big deal. That's not to say it isn't possible though, as the Dex (DSON Exchange) plugin for Maya shows (https://www.daz3d.com/forums/discussion/278111/dex-dson-exchange-plugin-for-maya/p1). Convert hair planes to curves with GHM2 (https://thundercloud-studio.com/product/gmh2/) and simulate with nHair for added realisim. The issue then is HD morphs, and how to get those out of Daz Studio and into Maya. When exporting an FBX file from Daz Studio, you get everything you need including morphs. But Daz only exports at the base resolution mesh. You can override this behaviour by locking the SubDivision Level in the Parameters Pane to whatever resolution you’d like to have in Maya. Be careful though, as this can take some time and produce large files because Daz Studio is exporting a HD mesh for each morph target and JCM you select. The weight maps are also broken due to changes in vertex count, but that can be rectified. Set the Division Levels to be the same as whatever you exported your HD mesh from Daz Studio. There may still be very slight differences in vertex position in some areas after applying the smooth. The important thing here is that the UV’s should match the HD version now, which gives a lot of flexibly for transferring data between the meshes. A quick tip here is to use Transfer Attributes (Vertex Position: On, Sample Space: UV). This will make your smoothed base mesh match your HD mesh exactly. Then, you transfer the skin weights from the rigged base mesh to the HD base mesh and hook up your JCM’s and pJCM’s. So that’s the basics of it, although there are a lot of smaller things in between. But the end result is a rigged Daz model in Maya with HD morphs and JCMS, and the ability to use poses, hair, clothing and textures. If you don’t care as much about having exact matching HD morphs and JCM’s, you could go the simpler route of simply smoothing and matching the rigged base mesh to a HD export static obj from Daz Studio. 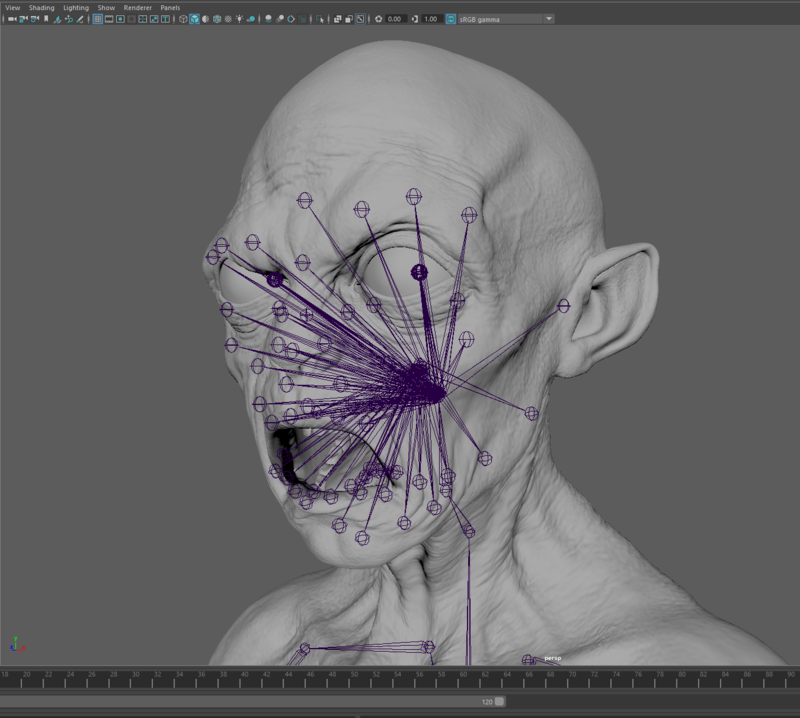 Then use seUVBlendshape or similar tools to move the HD mesh based on the UV’s of the smoothed rigged base mesh. And finally, I wouldn’t say you need to go above matching the subd1 export from Daz Studio for animation use. It’s a good balance between having enough geometry to allow for smooth weightmaps and bending, but not so heavy that it will be a chore to try and animate. You can then bake displacement and normal maps for the rest of the fine detail if needed. This will give you significantly better results than using just a smoothed base mesh default FBX export, even with displacement and normal maps. The point is, all of this can be scripted and automated to make the process of going from Daz Studio to Maya pretty seamless. No one has released a complete product yet, but that doesn’t mean it isn’t possible. I suppose it’s all about the final result you want to obtain. The MDD or Alembic workflow is a perfectly valid one too, but personally I cannot go from the freedom of animating in Maya to the much more restricted method of animating in Daz Studio. Daz Studio won’t gain much traction in other industries such as Game Dev and Film without the ability to seamlessly move assets between programs. Whether that is something Daz and the community would want to cater to, I can’t say. But that is where my focus lies. Personally, I’m going to continue on my “truly pointless endeavour” and help others along where I can. as you clearly are a highly experienced user of Autodesk Maya. looks & versatility in my final animation renders. most easily accessed inside Daz studio. style pose controls& pose loading . for animation which an experienced user like you, could have done without the plugin. retarget the motion Daz genesis figures Via custom BVH. and setting up cameras in Cinema4D . after only some minor texture tweaks. bathrobe ,unshaven with "bed hair"
fidelity issue is moot in a mesh Baked to MDD at whatever level of SubD it had in Daz studio. Of course all pipelines differ in terms of software imperitives and personal user preference. Just because it's not a current feature, doesn't mean it isn't possible. Poses are simply preset tranforms of joints. There's no technical reason that can't be translated to HIK. Not that you need to use HIK in the first place; most professional rigs are created using standard joints just like the Daz Studio fbx export. 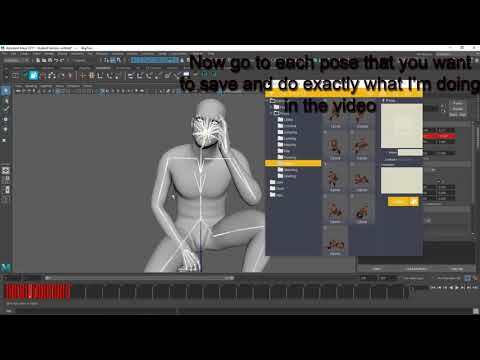 Pose controls are instead implemented as control rigs and set driven keys in Maya. Again, all of that can be scripted to be one click, especially considering the rig and geometry topology is always the same on export. As I said earlier, every step can be scripted and automated. There wouldn't be all of the labor each time. I feel you're hung up on what is possible right now with the avalible products, but if this isn't discussed and instead pushed to the side as impossible or not worth the effort nothing will change. Yes, pipelines will differ based on software and preferences. But i've frequently seen people being told on these forums that something won't work when that simply isn't the case. It's all possible, and someone with more scripting skills than myself could make it avaliable for everyone who's interested. There wouldn't be all of the labor each time. To me it makes no sense to be sitting in the mighty Autodesk Maya. only to have G9 arrive with some "exciting"new ornamental ,Pooware"enhancements"
that will break all of the existing plugins and scripts. And the fanciful chase after the golden unicorn begins anew. 2 figures into a Unity based Gameanimation pipeline Via Iclone. introduced non Daz, base Avatars and his pipeline is now as smooth as silk. That is some incredibly useful information. Thank you for sharing that.